Better Experience is an application published by Creative Island Media, LLC. It is very likely that this program will act in the same manner as Zombie Alert, Tube Dimmer, Websteroids, and the like; thus, if you have ever encountered any of them, you will definitely know what to expect from Better Experience. Unfortunately, this program is just a simple advertising-supported application, which means that it is just going to generate various in-text, interstitial, search-related, and pop-up advertisements because its main aim is just to advertise products and drive traffic to particular websites. The specialists of pcthreat.com have found out that Better Experience is compatible with Internet Explorer, Google Chrome, and Mozilla Firefox. It just simply means that you are going to see various commercial ads regardless of the browser you use. It is known that these ads are very intrusive and might even disrupt your browsing activities. Besides, you might even infect your system via them. If your system’s safety is an important issue for you, you should better delete Better Experience without any further considerations. This advertising-supported application is not only going to show you various advertisements, but also might perform other suspicious activities. For instance, Better Experience is known to be capable of collecting data associated with your browsing habits. It means that your browsing history, search queries, IP address, approximate location, internet service provider, the version of the OS, and other information will be recorded unless you delete Better Experience from the system. If you wonder why this program is interested in the aforementioned data, you should know that it will provide you ads based on the collected information in order to lure you into clicking on them. 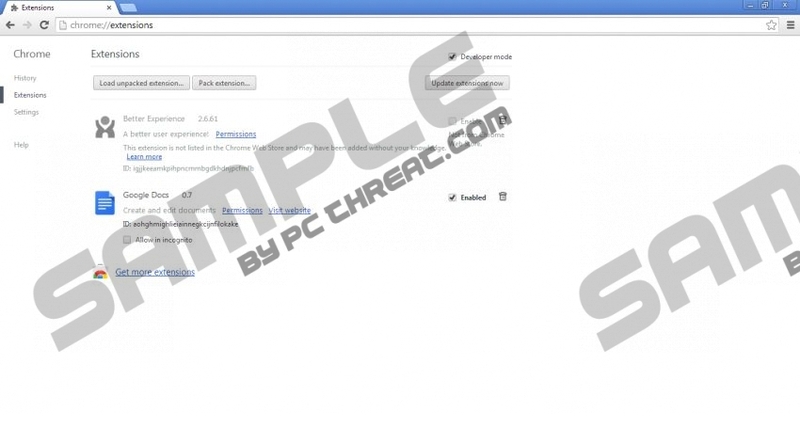 As the researchers of pcthreat.com have revealed, Better Experience travels bundled with freeware only. Thus, you should not expect to find its official website. Actually, plenty of advertising-supported applications use this tactics, which is why you should make sure that your system is protected 24/7. The most reliable way to do that is, of course, to keep an antimalware tool enabled. However, do not forget that it is not advisable to download programs from doubtful sources as well. Luckily, you will be able to eliminate Better Experience easily and quickly, which is why we do not recommend postponing this process for any longer. The easiest way to get rid of it is to scan the system with a licensed antimalware tool. However, you will be able to delete this adware manually as well. Even though the process is not difficult at all, we have still provided the removal instructions below the article. You can use them if you need some guidance. When All apps appears, click on it. Select Uninstall to erase it. Click on the green Start button. When the menu opens, locate Control Panel. Click on the program that has to be erased. Quick & tested solution for Better Experience removal.